Don't let this North American crown jewel slip away. Urge the EPA to come up with a monarch butterfly rescue plan. 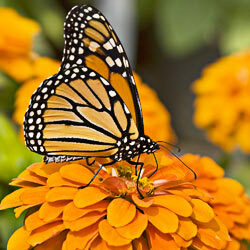 The monarch butterfly is one of the most recognizable and revered butterflies in all the world. Each year, the monarchs begin a remarkable journey when they fly north to lay their eggs—some as far as 3,000 miles. For three brief generations, each lasting only one or two months, the monarchs mate and breed. The fourth generation of butterflies then returns to Mexico where they hibernate in a remote forest for six to eight months, until it is time to repeat the process. It is a process that has continued uninterrupted for 250,000 years, but the last 15 years have seen dwindling numbers. In the US, modern pesticides are killing milkweed, a primary source of nutrition. In Mexico, illegal loggers destroy their habitat. Don't let this crown jewel slip away. Urge the EPA to develop a monarch butterfly rescue plan. The beautiful monarch butterfly is facing some tough times. This North American symbol of majesty and peace has seen a sharp increase in habitat and food source loss over the past few years, which can mostly be attributed to illegal logging and modern pesticides. The monarch butterfly has a fascinating and unique life cycle. Each year when the cycle begins, the butterflies fly north to lay their eggs. Three sets of generations are born within the next few months, and survive by feeding on their chosen source of nutrition—the milkweed plant. In fall, the fourth generation migrates thousands of miles to warmer climates like Mexico, where they band together in massive droves and hibernate in Oyamel trees. But both ends of this life cycle are now being threatened. Farmers in the United States have begun using pesticides that kill off milkweed, and logging in Mexico continues to deplete the monarch habitat. The butterflies are facing trouble in each step of their growth. I am writing in hopes that you will acknowledge this growing problem and devise a strategy to save our majestic monarch from further destruction. The Mexican government reported the lowest recorded levels of Monarchs after conducting their annual census in the butterflies' winter home. With Monarchs occupying only 2.94 acres of forest, the latest figures mark a 59 percent decline from just two years ago, likely exacerbated by droughts and high temperatures in the American Midwest, where the Monarch seeks food in the summer. Urge the EPA to intervene before its too late! That's 26,415 signatures! Let's keep the ball rolling.